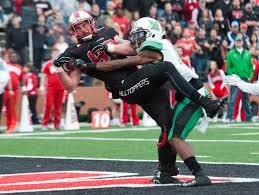 TE-Tyler Higbee, Western Kentucky 6′ 6″ 249 lbs. Cons: Perhaps the young man’s first concern is his lack of judgement and timing with his recent arrest. Is he in control of himself? Surely the pressures of the NFL will be more intense than him facing a knucklehead in a bar. This action may drop the tight end down several rounds or perhaps even out of the draft entirely forcing him into street free agent status. After that, are his knees an issue? On Western Kentucky’s Pro Day, March 29th, Higbee did not run the 40-yard dash, nor did he do many of the Combine drills because his knee was at 75-80%. Those same knees caused him to miss five games last season, including the bowl game against South Florida. Please consider the tight end only started for one year with only eight healthy games and he didn’t exactly face the highest competition playing in Bowling Green, Kentucky. The former Hilltopper also has issues blocking inline with regard to him using the right leverage or delivering power while he blocks. It’s looking more and more like he will be more of a Joker tight end, which doesn’t exactly bode well for his fantasy impact when you consider the recent struggles of Eric Ebron, Jace Amaro, and Austin Seferian-Jenkins (whom all resemble Higbee and share some injury concerns). Pros: He has amazing athleticism for a man his size and has the room to put on an additional twenty pounds of muscle without losing any of it. In game film, it seems that the tight end has good straight-line speed with a nice sense of balance that makes him hard to bring down (even when he gets knocked down, the former Hilltopper bounces back up quickly). Higbee was versatile enough to line up inline, in the slot, or split out; however it is more likely he will get used in the Joker role. The tight end looks to be more of a wide out with his soft hands in traffic, shielding the ball from the defenders. The former Hilltopper can out-leap his coverage to catch the pigskin at its highest point, tracks the ball well in the air, and can run underneath it downfield making the reception in stride. Higbee runs crisp routes, has a good catch radius, and will work his way back to his quarterback when he senses trouble. There is a bit of a running back’s swagger to his game when the tight end busts out a spin move, a stiff-arm, or simply lowers his shoulders to run over a smaller defender. He established himself as a red zone threat by scoring in five of the eight games he played. Overall impressions: There are too many character and injury question marks to invest a lot in this young man. When Higbee is on the field, the tight end shows off his athleticism, but how often will that happen? I could take a chance on the former Hilltopper, but not until at least the end of the third round or lower depending on what team takes him and when. He is a riskier player than what I like to get myself invested in, so take that with a grain of salt. Thanks for reading and hopefully supporting the website!